We always anticipate exciting navigation as we head for the Antarctic Circle. The region is home to several fascinating historical sites including the old British Antarctic Survey (BAS) hut – “Base W” situated on Detaille Island. We encounter sizable Adelie penguin rookeries here and the low-lying Fish, Argentine and Yalour Island groups provide fantastic options for Zodiac cruising and wildlife observation. Many of the classic locations along the Peninsula are also included and a day in the South Shetland Islands rounds out the experience. Our full range of activities will be offered on this voyage – walks on shore, visits to wildlife colonies, visits to historic sites and possibly even a working science station. For the more adventurous, sea kayaking is a wonderful way to discover Antarctica – and if weather conditions permit – why not spend the night camping on shore? George Island (Antarctica) on Day 1. Overnight we have navigated across the Bransfield Strait and wake to the towering peaks of the Antarctic continent laid out before us. 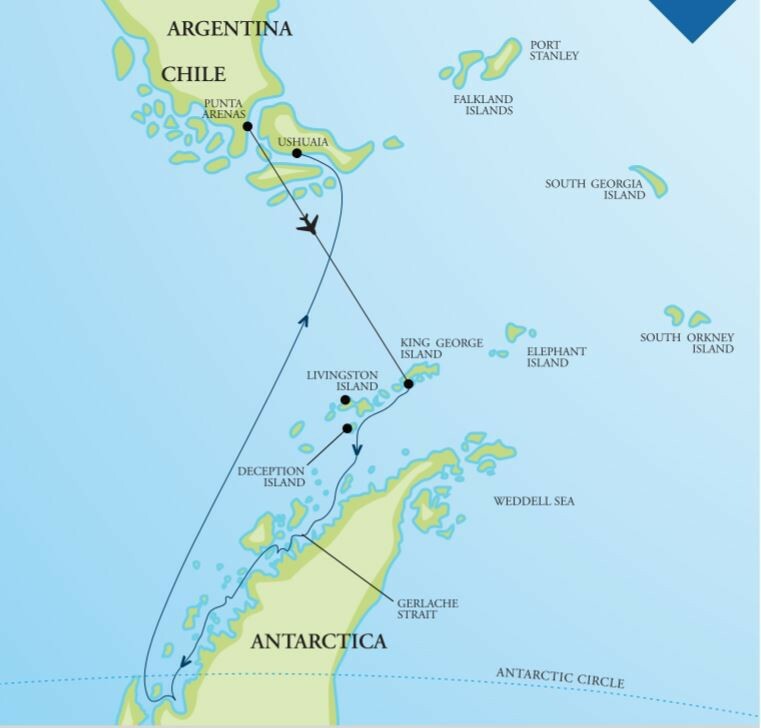 Our first objective will be Cuverville Island, situated in the Errera Channel. We venture on shore and observe a substantial colony of gentoo penguins as well as nesting Imperial cormorants. A stroll along the rocky beach here, watching the penguins come and go is a memorable experience. The sea kayakers may take to the water for the first time and there is some great paddling around the island to be enjoyed. As we navigate our way out into the Gerlache Strait - we are on our way to the south, aiming for the Antarctic Circle.